With a remarkable blend of function and art, We offer glass kitchen countertops, backsplashes and raised bars that literally transform your eating area. With a remarkable blend of function and art, The Renovation Store offers glass kitchen countertops, backsplashes and raised bars that literally transform your eating area. Glass countertops 1.5" thick or more. Single seamless pieces made up to 7' x 10'. As popular as the Natura and similar, it has a more uniform flow in the pattern. Our version of crackled glass. A soft texture with sporadic lines resembling a natural crackling effect. Minimalist, clean and crisp, virtually textureless. Sweeping brush strokes creating a soft directional pattern. Like freshly fallen raindrops creating a unique water like pattern. Wave like pattern, resembling the sea, most popular for ocean side residences. Resembling an earth like pattern. Small indentations create an unusual pattern for unique spaces. This is our standard thickness. Feel the depth of our textured glass. When you want or need just a little extra! Make a statement with your glass countertop. The Designer's choice is a low iron glass which provides exceptional light transmission, and depending on the thickness, ranges from virtually colorless to light blue in appearance. A clear choice for many applications! The natural color of glass, inherently green and deep in color. Each Glass countertop can be finished with any one of these beautiful edge treatments. Like a piece of chiseled rock, this edge profile is rugged looking yet soft to the touch, popular with both contemporary and traditional designs. These are the custom colors that can be mixed together for imbedded art by Mailhot. The splendor of our artglass countertop by Mailhot. 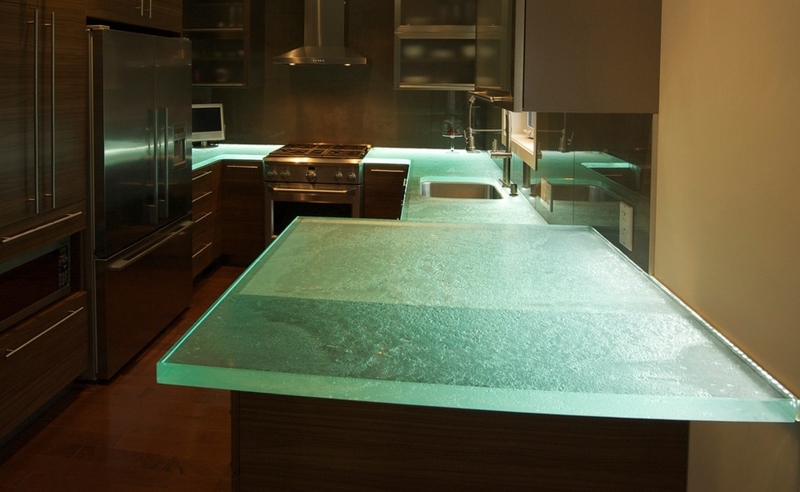 We now offers a full LED solution for all your lighting needs in order to further highlight your glass countertop. The most powerful LED's on the market to illuminate kitchens, bar tops, raised bars, and outdoor kitchens! No other countertop material can offer you such versatility along with the possibility of transforming your glass to suit your mood or special event. In addition, Master Glass Artist, Michel Mailhot can create a custom artistic countertop which can be illuminated and further enhanced with lighting. Below you will see some of the available colors. Please note, that AlterEgo, our lighting consultant can customize the lighting to fulfill your specific request. Combine texture and shape with a colored or metalic substrate to make your see-through glass countertop even more revealing and dazzling. (Substrate not provided by The Renovation Store). We recommend a metallic or glossy finish to enhance the light in the countertop. Stainless, chrome, glossy white and copper are the most used colors.